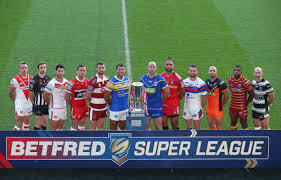 Not a shame about the competition, a shame that we will never see this Qualifiers round again thanks to the owners of the Super League clubs voting to dispense with the concept and go back to the boring one up one down system. A simple case of trying to shut the stable door after the horse has bolted and I sincerely hope it comes back to bite them all. It’s not this area that needed shaking up it’s the waste of time Super 8’s that is the problem. So with just one round remaining we have the very real prospect that possibly three Super league clubs could go down and three Championship teams fighting their way in to the Super League. Unlikely, its true but it is possible and that makes this weekends games, starting tomorrow night fascinating and compelling and a great chance to cheer on the underdog. Salford Red Devils vs Toulouse 7.45 Thursday. If Toulouse lose this game in all probability that is Salford safe and Toulouse out of the contest, even for the million pound game. However, should they win and results go against Salford, the Red Devils could find themselves out of automatice qualifying and playing in yet another million pound game. They sat comfortably at the top of this list for so long and now with an untimely loss they are being dragged back in. The fear is all with the Red Devils. Toulous can play fearless rugby, they have nothing to lose and that for me is when French Rugby teams are at their most dangerous. They play physically agrressive rugby and they throw it around. They are rightly the underdogs but never underestimate pressure and for that reason I think they are a bit of value to pull off the first of our shock results. They shouldnt be 3/1 and this salford side simply isnt that good. Toulouse need to hang in for as long as they can and the pressuire will really start to tell. For all that the Rhinos look safe that in itself must scare Hull KR and Salford because they just might not be as desperate as the Wolfpack who easilyb accounted for Widnes last weekend (no big deal I hear you say) and should have beaten Hull KR. Will Toronto rue that missed chance. Are they capable of beating Leeds? Well in principle its only a challenge cup game here and these results happen all the time. The Wolfpack are fit and well and looked good last weekend and the Rhinos might not be wound up to play the level of Rugby required to get the points and deny the Canadian team. I cant wait for this game. Note : All prices advised are correct at the date/time of publishing.